In brief: Michael Booth has cemented his reputation as the strongest stand up paddler on the planet, taking out week 5 of the EuroTour in impressive fashion after breaking an elite field that included Connor Baxter, Titouan Puyo, Georges Cronsteadt, Mo Freitas and many more of the world’s best. After the early stages of the ‘Thonon Race’ were marked by the presence of rival draft trains that jockeyed for the virtual race lead, the contest eventually settled down into a more traditional draft train, with the front pack at one point morphing into an unsustainable 21-man convoy. Following a series of unsettling attacks that tested the nerve of his rivals and splintered the front pack, Boothy broke the field relatively early today – at about the 4km mark of the 18km crossing between Switzerland and France – and would never be caught, slowly extending his lead all the way back to the finish line in the host town of Thonon-les-Bains. Titou tried valiantly to close the gap but to no avail, leading the chase group that included Connor, Bruno Hasulyo, Trevor Tunnington and Leo Nika as the race eventually became a battle for second. 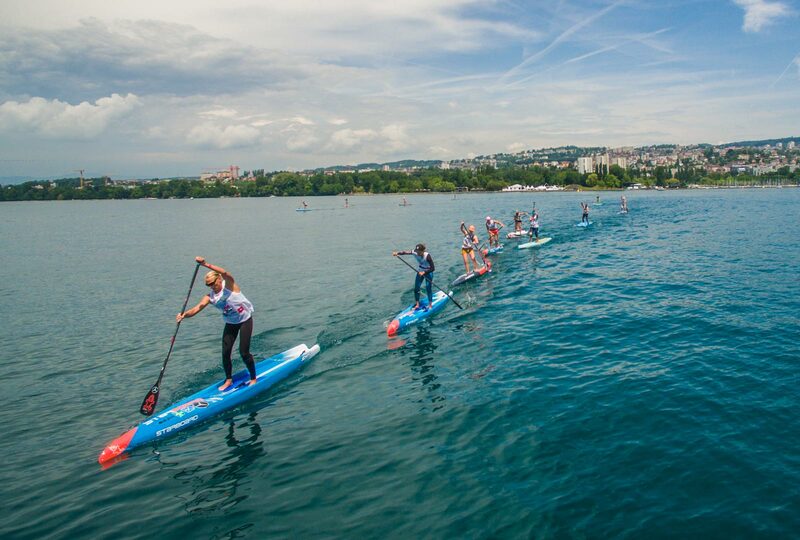 Riding the new 2018 NSP Sonic as he battled a sea of Starboards, Titou held on to claim the second step of the podium after breaking the other contenders around the 16km mark. Connor rallied late and almost closed the gap on Titou in a mad scramble to the line, but the world number one had to settle for third ahead of his Starboard team mates Trevor, Bruno and Leo. 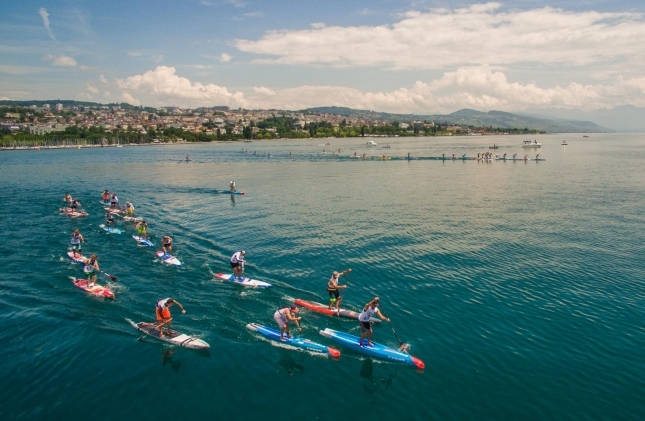 A brave Georges Cronsteadt, who chose his own line across the lake and paddled virtually the entire way on his own, came home in 7th after straying just a little too far away from the main line – at the halfway mark he was in the virtual lead. The fast-finishing Vinni Martins was mowing down paddlers over the final stages en route to an 8th place result – quite impressive considering the Brazilian hit the wall early and was outside the top 20 at one point. The unheralded Italian Federico Esposito finished 9th, which is a hugely impressive result considering the level and depth of talent on the start line. Federico was the sole dark horse to crack the top 10 among an all-star field of international athletes. World number three Mo Freitas, who at one point was tracking in virtual 2nd as he also took his own line across the lake, had to eventually settle for 10th as he continues to work back to 100% health. In the women’s it was the same story once again: Sonni Honscheid claimed her third straight EuroTour race, which gives the German powerhouse a massive buffer on the EuroTour Leaderboard as she looks for her third straight European title. But once again it was a very impressive performance from Olivia Piana in second place, as the Frenchwoman stayed within shouting distance of her Starboard team mate all the way to the line to eventually cross about a minute behind. Though the most exciting finish of the day was between the next three ladies, with Seychelle Hattingh hanging on in a sprint finish against Euro dark horses Susak Molinero and Amandine Chazot. Germany’s Susanne Lier was 6th, while a name to watch in the future, Laura Bartl (daughter of European racing veteran Peter Bartl), completed the crossing in an impressive 2 hours 2 minutes to claim 7th. 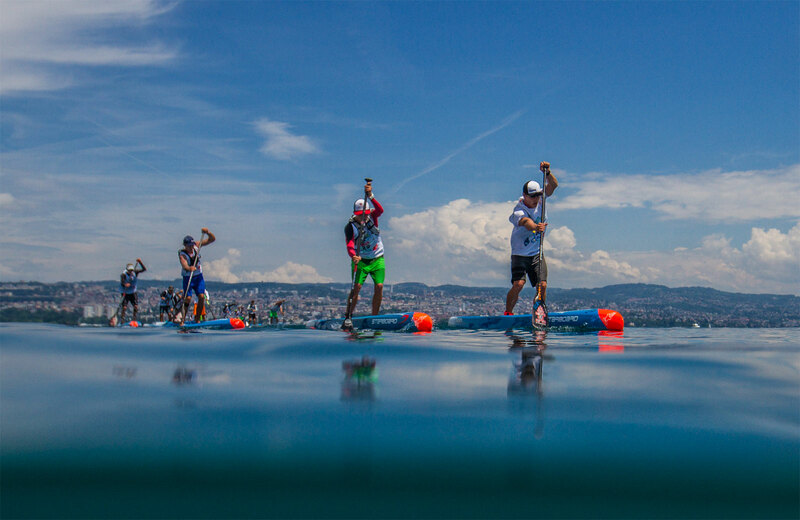 We’ll have full results shortly, but in the meantime you can watch a full replay of our EuroTour Live Stream from Lake Geneva. Big thanks to Fred Bonnef and the crew for pulling off a great event. And unlike the past couple of weeks, there’s only one day of elite racing here in Thonon (which is a relief to the top athletes). UPDATE: Full results have been posted below. We’ve also updated the 2017 EuroTour Leaderboard: Boothy and Sonni have extended their respective leads on top of the tables, Connor and Titou are locked in a tight battle for second, while some of the Euro dark horses have made big jumps this week.